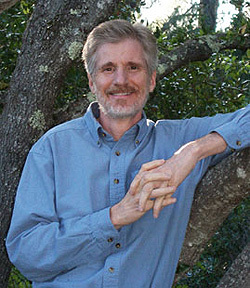 John Thompson, Distinguished Professor of Ecology and Evolutionary Biology. Photo by J. MacKenzie. John Thompson, Distinguished Professor of ecology and evolutionary biology at UC Santa Cruz, has been chosen to receive the 2009 Per Brinck Oikos Award in recognition of extraordinary and important contributions to the science of ecology. The award was established by the ecology journal Oikos in honor of the Swedish ecologist Per Brinck, who has played an instrumental role in the development and recognition of the science of ecology and served as editor-in-chief of Oikos for many years. Per Lundberg, who administers the award as current editor-in-chief of Oikos, said Thompson has made "seminal and outstanding contributions to a variety of central ecological issues and problems." His work on coevolution and plant-animal interactions have been particularly influential, Lundberg said. Thompson, the author of three books on coevolution, studies how interactions among species organize Earth's biodiversity over broad geographic landscapes. "One of the great problems to solve in biology is how coevolution has fueled the diversification of life and organized it into complex webs of interacting species," he said. The goal of Thompson's work has been to develop a science of coevolutionary biology that takes into account how species coevolve across complex and ever-changing environments. "We now know that geographic mosaics of coevolution can become altered over time scales as short as a few decades," he said. "That observation makes our developing understanding of the coevolutionary process increasingly relevant to conservation biology, restoration biology, epidemiology, and agriculture at a time when our societies are transforming all the major ecosystems on Earth. My decades of studying coevolving interactions have made me appreciate the irreplaceable importance to science and society of the few remaining wilderness areas on Earth." Thompson will give the Per Brinck Oikos Award Lecture at the Swedish Oikos Society meeting in Uppsala, Sweden, in February 2009. The award is sponsored by the Per Brinck Foundation at the editorial office of the journal Oikos and Wiley/Blackwell Publishing.